Traveling exhibit on loan to its first location. The first stop for our new traveling exhibit is Tampa, Florida. More than 30 different museums expressed interest in borrowing our ribosomes exhibit. To increase Laboratory outreach and promote science education around the country, the Museum has shipped a special exhibit on ribosomes to its first location. Designed to display and ship compactly, the interactive, standalone piece will first go to the Museum of Science and Industry in Tampa, Florida. It expects to debut the exhibit for three months beginning in January. While many organizations have traveling exhibits for loan, most charge a fee that can range from thousands to tens of thousands of dollars. When you add in the resources needed to ship and install these showcases it can become prohibitively expensive, particularly for smaller venues. In contrast, the Laboratory’s Museum loan program is free of charge with the receiving organization only paying the freight to its location. 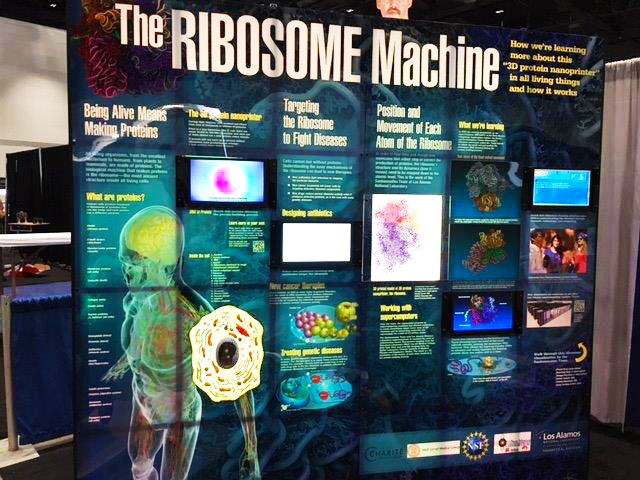 “The Ribosome Machine” display was introduced at last year’s Association of Science-Technology Centers (ASTC) conference in October in San Jose, California. While there, more than 30 different museums expressed an interest in borrowing the exhibit. “The idea is to have the display ship directly from one location to the next,” said Linda Deck, the Lab’s Museum director. “That way each venue only needs to pay for shipping to them.” As an example of potential costs, shipping the crates from San Jose back to Los Alamos cost about $500. As part of our continuing science-education outreach, early in 2018 Museum staff and other Laboratory organizations will prepare a new exhibit for next year’s ASTC conference while we continue to loan the Ribosome display to those who would like to display it. Not sure if you can get to Tampa (or another location where it might end up)? We plan to install a semi-permanent replica of it here in the Museum beginning in the spring. Stay tuned to this newsletter and social media to learn more.